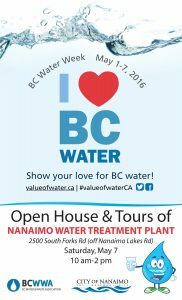 The City of Nanaimo is proud to participate in BC Water Week (May 1-7, 2016)! To celebrate, the City will be hosting a public open house and tours of the newly-inaugurated water treatment plant! Have you ever wondered where your water comes from? Come to Nanaimo’s open house on Saturday, May 7 from 10:00 AM to 2:00 PM. Meet the staff who operate the plant and enjoy a tour. Tours will be held every half-hour, depending on attendance. Nanaimo’s water treatment plant is located at 2500 South Forks Road in Nanaimo, BC.